Waking Gods begins nine years after Sleeping Giants. Our main characters return – Rose, the unnamed interview, and the rest. The fears of Mr. Burns, the mysterious, probably alien descendant, are seemingly beginning to come true. Another giant robot appears, this time in the middle of London and with no warning. It isn’t Themis, the machine whose hand Rose fell into as a child. That one’s safe and sound with its pilots far away from the chaos. This is a different one. A new one. And it’s already manned. Things go from uncertain to worst case scenario pretty quickly in this book. Rose has some personal things to sort out as being technically dead for a while does tend to do. But there’s little time to deal with either that or Kara and Vincent’s relationship as more robots appear across the globe. All are in the world’s most populated cities. None of them seem overly fond of the human race. Problem is, all of Themis’ secrets aren’t unlocked, it’s a very old machine as far as the obviously highly advanced nonhuman race is concerned, and there’s only one of it. Our mysterious, unnamed interviewer attempts to control the unfolding chaos, guiding the others as best he can for as long as he can. But as the situation worsens, he quickly finds himself losing any of the control over events he once had. This is something we saw in the first book with the interviewer seeming to flounder a little bit in the face of unforeseen circumstances as the situation worsened. His humanness, his true personality, become more apparent as this book goes on. Watching this character I’ve grown to love, this smart, clever narrator who seems nearly omniscient at times fall into the trappings of any other person in a stressful, frightening situation is quite refreshing. Mr. Burns, too, appears a just bit less certain in this book, though with all of his metaphorical stories it can be a bit difficult to tell at times. This book is also told through alternative formatting, as was the first in the series. We have news reports, phone calls, recorded conversations, and more relaying the story. If you have reservations about this method, don’t worry. This formatting really works for this series. At no point did I feel disconnected from the characters or plot. Also, the story takes place over the course of just over a year. This is still a decent span of time, though nothing quite as extensive as book one in the series. Despite the long time span, the majority of the action, as well as the majority of the story, do take place over a relatively short amount of time. Once things get moving in this installment, they really get moving. If you’re anything like me and have a tendency to pick up a series somewhere in the middle and read the first few books later, you may want to hold off on that with this series. While you may be able to figure out what’s going on, you will miss a lot by not reading book one, especially on early character development and the introduction of some important side characters. Don’t let the long span of time during in-world events fool you. A lot happens during the course of this novel, and jumping in at the middle will be doing yourself a disservice. On that note, this book begins the action long before the first one did. Sure, the team is still learning about Themis, what she can do, and how to do it. But there are real, immediate problems in this novel which begin more or less as the book opens. This is an edge of your seat ride the whole way through. Now, I am a huge manga and anime fan. I have read and watched countless giant robot stories. The Themis Files is one of the absolute best stories I have ever experienced in this genre – novel, manga, or anime wise. Waking Gods does everything the second novel in a series should, but so often does not. This is not a skippable book with a plodding, predicable plot or stuffed with backstories and character development in compensation for lack of action. (I’m not salty about other second books in a series. Of course not). This is a good book, one that isn’t afraid of what it is or what it has to say. 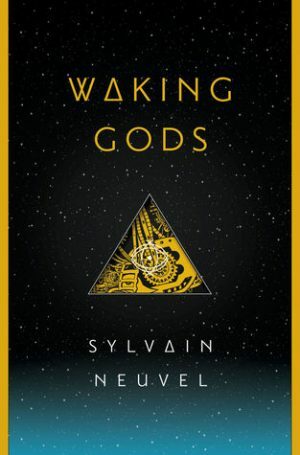 I highly recommend reading Waking Gods by Sylvain Nuevel. Not only has this novel proved to be one of my favorite titles released so far this year, The Themis Files has earned a place on my list of favorite series of all time. Honestly, I can’t recommend this book enough. If you enjoyed the first book, are a fan of science fiction, or even have a passing interest pick up this book. You will not be disappointed. Fans of mecha anime and manga will definitely find a lot to appreciate in this series as well. If you don’t enjoy alternative formatting in novels this may not be the book, or series, for you.